I've just discovered that making your own tiramisu can be both simple & daunting at the same time. Simple cuz you don't have to bake it. It can be daunting due to the difficulty to get the right ingredients at an affordable price unless there's a shop at your neighbourhood which supplies baking needs. Mascarpone cheese & whipping cream are easily available at supermarkets but with a hefty price tag. Took me a while to prep all the ingredients cuz I was foolish for not visiting the baking shop that my colleague recommended earlier. With all the ingredients laid on the kitchen counter, I read through my colleague's recipe & strictly followed the instructions without missing a step. Instead of using rum, I replaced it with kahlua (coffee liquor). 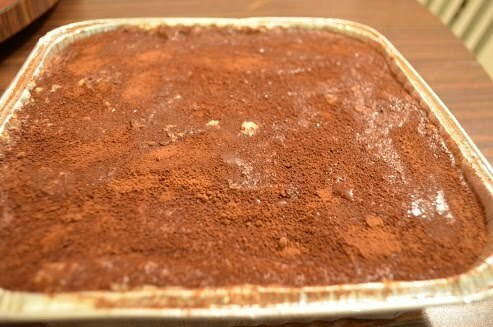 After sifting the cocoa powder generously on the mixture surface, the cake was left to chill for 4 hours or more. Upon checking the cake, I found out that the texture was too soft & a little watery. It was difficult to cut & the sliced cake always ended up in a mess. Nevertheless, the taste was heavenly with strong coffee & liquor.